SPECIAL NEEDS EDUCATION: A DIRE NEED IN CAMEROON – AFRICA. They say, “necessity is the mother of invention.” Nowhere else is this so true as in “Third World” nations – where the average person is always trying to get their heads above the water and where survival is the norm and most folks can be found doing “whatever it takes” on a daily basis. We are fundraising to pay for trainers for the teachers and a school bus. 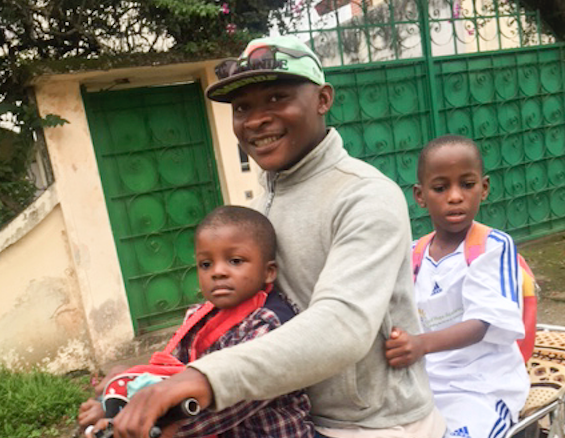 Ernest Ehabe, our president painted a room in the spring of 2016 in his house in Douala to providing specialized tutoring for his special needs child. Little did he and his wife know this would evolve so rapidly to include several special needs children. Soon their home turned into a school (without any kind of advertising). By September 2016 the school moved to a semi-permanent structure and fully begin operating a school with an emphasis on special needs education. 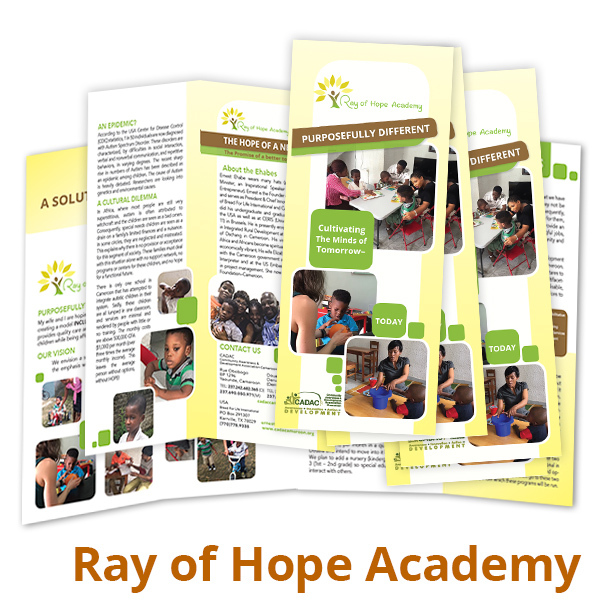 We have named the school RAY OF HOPE ACADEMY. In Africa – where most people are still very superstitious, autism and other educational special needs are generally attributed to witchcraft and the child being a bad omen. Sadly, this is a belief held even by Christians. Consequently, special needs children are seen as a nuisance and a drain on a family’s limited finances. In some circles, they are neglected. There are no provision or emphasis, even by the government or educational institutions, for this segment of society. There are only a handful of speech or occupational therapists in the whole country of Cameroon. They are busy and their fees are very high. The average person can not afford their services. Only one school in Cameroon has attempted to integrate autistic children in their system. Sadly, they are all lumped in one classroom and parents have to pay a whopping $1,000 and more a month for services which are minimal and rendered by folks with little or no training. In a country where the average monthly wage is less than $200, only the very few super “rich” can afford this kind of school. We are prayerfully building a model school and community. Our goal is for it to be a Pre-K through 12 grade, fully inclusive. It will personalize education for children from every walk of life and serve as a model and reference center for special needs children. The emphasis will not be on head knowledge alone, but, where children can also be touched with heart knowledge and equipped with hands knowledge. The end resulting in cultivating the minds of tomorrow – today! Together, we can effect positive and lasting change to the glory of the ONE who came so we may all have BREAD FOR LIFE! • Therapists with training in ABA therapy and in PECs. • Child Psychologists who can help with training and in evaluating each child. • Financial support to get this school up and running. • School supplies, pens, pencils, and crayons, text-books, exercise books, wall charts, smart boards, Coloring and drawing books, books for the library, etc. • Sensory and motor skill development equipment. • Canteen and office equipment and supplies. We are starting with four full-time teachers. Only one is trained (in sign language), the rest could use some training. 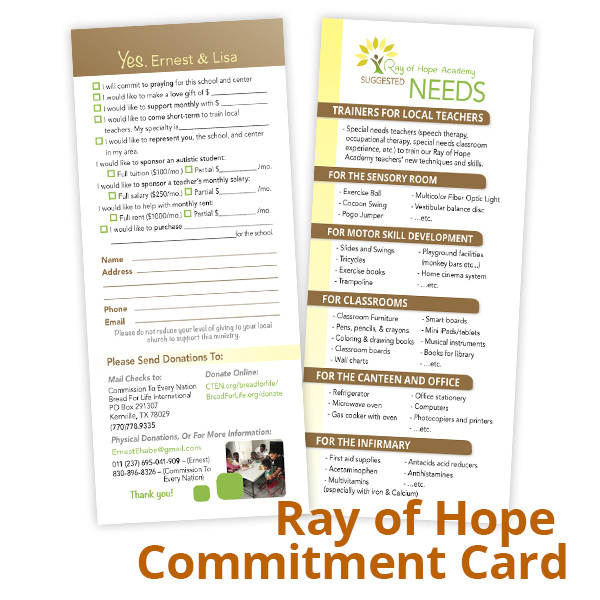 Ernest and his wife have put their LIFE (Labor, Influence, Finances & Expertise) into this. They are reading up everything they can, researching and learning and passing on the knowledge to the small staff.